You begin, and end, your day in the bathroom – so when you decide it is time to remodel or redesign this room, you want to partner with professionals. Cossentino and Sons has completed hundreds of bathroom projects, helping our clients attain the look and feel they want to achieve. 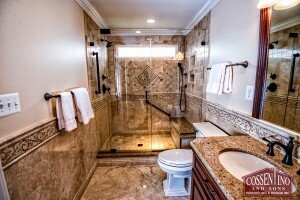 Cossentino and Sons is a design/build remodeler and completes “gut and remodel” projects for our homeowners. Remodeling a bathroom can be difficult because of the numerous decisions that you have to make, from the selection of faucets to the selection of shower floor to the placement of towel racks. Finding a place to start does not have to be overwhelming when you work with our team. Your first meeting with our owner Wayne Cossentino will determine the scope and size of the project and establish a budget range. Once that has been approved, the design stage begins. Our bathroom designers will work with you to make your selections for faucets, tubs, tile, cabinetry, countertops, lighting, and stylish, efficient commodes. The construction phase of a bathroom project is taken care of by our crew of dedicated, experienced professionals. They treat your home and property as if it were their own, and keep the work area clean and debris free. Everything that is removed from the bathroom is hauled away by our crew, and they do their very best to stay on schedule. 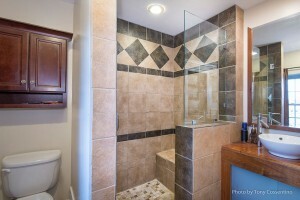 Once your bathroom remodeling is complete, you will have a brand new room that functions as an oasis in your busy day. Whether it is the heated marble floors, the multi-nozzle shower, or the therapeutic tub – what you envisioned will have become a reality for you and your family to enjoy.